Fall can’t get here fast enough, so I tried to hurry it up by baking this spicy Sweet Potato Bread. It is very much like pumpkin bread, but with a slightly different flavor and light texture. In fact, you might like it even if you don’t care much for sweet potatoes. If you use an 8 1/2 by 4 1/2 inch pan and don’t make any major changes to the recipe, you should get a really nicely shaped loaf with a pretty dome. Also, the bread is sweet and in a good way. For a less sweet bread, you could probably get away with cutting 2 or 3 tablespoons of sugar, but I haven’t tested that yet. 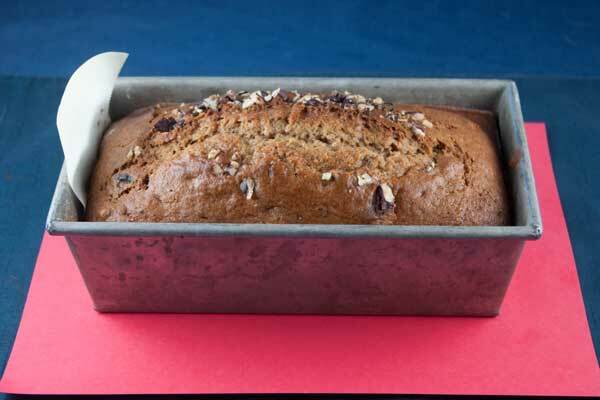 A rich, sweet quick bread made with sweet potatoes and toasted pecans. Preheat oven to 350 degrees F. Grease and flour a loaf pan. I used one that was 8 1/2 by 4 1/2 inches, but you could probably get away with a 9x5. In a small bowl, mix together the flour, salt, baking soda, baking powder, cinnamon and pumpkin pie spice. In a mixing bowl, whisk together the sweet potato, sugar, brown sugar, vegetable oil, eggs and vanilla. Add the flour mixture and milk alternately to the sweet potato mixture, then stir in the pecans. Bake for about 55 minutes or until a toothpick inserted comes out with clean crumbs. For the sweet potato, I started with one that weighed about 10 oz raw, peeled it, chopped it, boiled then mashed. I’m with you – fall can’t get here fast enough! Your bread looks wonderful. I’ve never had sweet potato bread but will try this recipe as soon as I have some potatoes. Oh yum! This I will try. I tried talking my dau. and son-in-law into grilled sweet potatoes when they were here over Labor Day weekend. No dice. The chickens!!!!!!!! PERFECT for the (sadly) approaching start of autumn. Thanks Anna!